We’ll start by examining the types of network topologies, how they operate logically and physically. Then we will look at some of the technologies these networks use to utilize the topologies. The physical topology refers to the hardware used to create the network. Hubs, switches, and routers along with the cables and connectors used, define the physical aspect of networks. The logical topology refers to the non-hardware aspects of the network. This includes the operating systems and protocols used to communicate on a network. The logical topology covers how the nodes on a network use applications and share data. 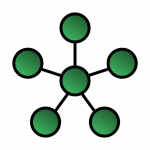 In a star topology, all network devices are connected to a central device like a hub or switch. Consider the spokes of a wheel connecting to a hub. In networking, a hub acts at Layer 1 of the OSI model and the switch at Layer 2. In a star topology, switches are preferred because hubs generate frequent collisions. 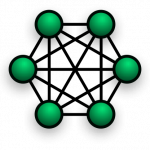 Considered a legacy topology the ring topology is a continuous ring of connections where each node is connected to the nodes directly adjacent to it. Data is passed from each node to the next, in a circular pattern. A node can only transmit to the next node on the ring. Token ring is the method using a token that is passed from one node to the next. While a node has the token it can pass it to the next node. It can also receive and replace the data if it is the destination of the token. 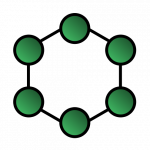 While actually resembling a star topology the central point is a MAU (Multistation Access Unit) that receives a token and forwards it to the next node in the ring. A failure in any node will isolate the other nodes and the failed node must then be removed or disabled by the MAU. In today’s wired environment mesh networks are rare. The concept of redundant connections remains applicable to the wireless environment as you will see later. 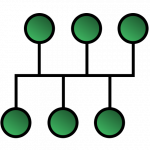 The wired mesh is configured so that each node will have a direct connection to every other node. For example if you have a network with four PCs, each would have three connection points with each connection linking to another network node, as the network grows the wiring itself becomes more challenging. Mesh networking reduces the “single point of failure” that a hub or switch would represent. The bus topology uses a single cable to connect all network nodes. This cable has only two endpoints and must remain intact. Signals can travel in either direction on the bus. So a signal can be transmitted both directions from a node. The signal will travel the length of the bus until the destination node is reached. If a signal is allowed to continue to the end of the cable it will bounce back, creating interference and unwanted noise on the line. This signal bounce is mitigated by using terminators at both ends of the cable. This topology is economical to implement but hard to manage since the bus itself represents a (large) single point of failure. You may find the bus topology as a backbone for routers and switches. A good example would be a network that covers five floors of a building. Here each floor would be a star topology with a router serving each floor. The routers would use a simple bus cable to connect to each other. Wireless mesh networks can be connected with or without wireless routers and gateways. This configuration is best deployed in a static environment. Network devices can be used to support more connections. Movement of nodes triggers routing updates to all which create network congestion. Special purpose ad-hoc wireless mesh networks can be configured to enable communication between nodes without routers and gateways. The nodes must be in close proximity to each other. This configuration is best used where there are few connections to static devices. The wireless infrastructure uses connectivity devices to distribute the signal over the intended coverage area. Wireless Access Points (WAPs) can be used to create or extend the coverage area. WAPs should be centrally placed to provide even coverage to the nodes. Multiple APs can be used to extend the coverage area.